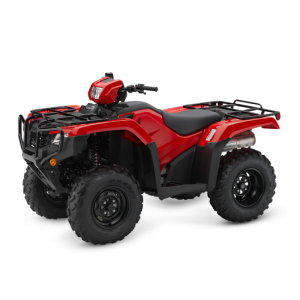 New Honda Foreman 500 (TRX500FM2) Manual with Power Steering. 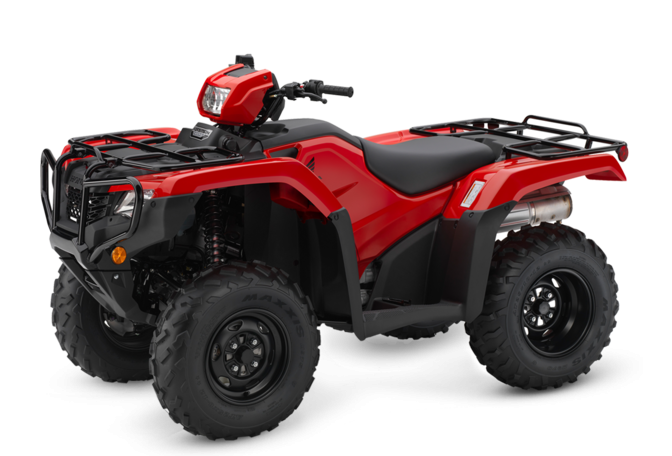 The Foreman is built with all the quality, reliability and advanced features expected of a Honda ATV. The ATV that just loves to get stuck in. The Foreman is a heavy-hitting ATV built for hard work and hauling big loads – day in, day out. Big loads, long days – no problem. Some days you feel like it’s all uphill. Lucky you’ve got the Foreman working for you. The low-down torque from the liquid cooled engine lets you tackle the really rough terrain, as well as those big towing jobs. Experience has taught you well and you know one thing above all else – you can rely on a Foreman. Ready for whatever you’re doing, the Foreman’s triple headlight system uses a single 45-watt upper bulb and dual 30-watt lower bulbs with multi-reflector lenses for optimal light distribution, plus an LED brake light/taillight for improved visibility. TraxLok® lets you easily select 2wd or 4wd. 2wd gives lighter steering on flat ground while 4wd maximizes traction when you need it. The Electric Shift Program (ESP) allows the rider to shift gear at the touch of a button. A handlebar-mounted control switches the transmission between ESP and automatic operation and a column-style shift lever lets you easily select Drive, Neutral or Reverse. Total efficiency for every job. Let’s get a shift on. Dual front discs feature brake calipers with a patented built-in scraper system to remove mud and snow. Large radiator and fan ensure optimal cooling under tough operating conditions. Electric starting also features auxiliary recoil. 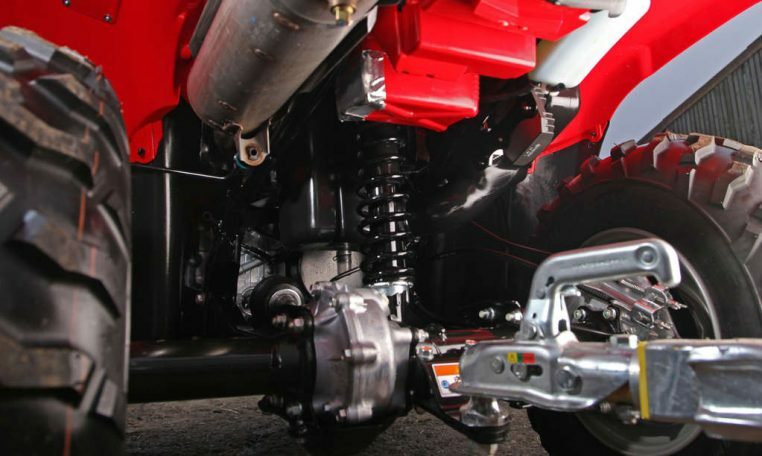 Independent double-wishbone front suspension ensures smooth progress over rough terrain. Large racks feature an improved design for easier lashing of cargo. Axle-mounted, heavy-duty trailer hitch with up to 385kg towing capacity. Rear-opening storage compartment allows access when the rack is loaded and there’s a water-resistant left-side glovebox. Waterproof accessory socket provides 12-volt, 10-amp power. 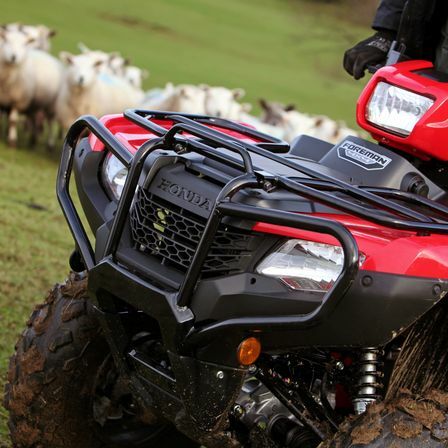 Whether you’re using it for farming, game keeping, forestry, equestrian or snow clearing, your Honda ATV will quickly become an essential part of your daily routine. 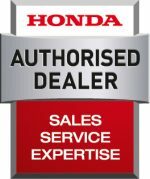 You’ll rely on it in all weathers, on all terrain and for an amazingly wide range of jobs. 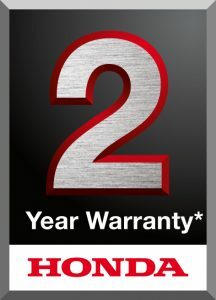 So a problem with your new ATV is the last thing you’ll want, but with Honda’s reputation for reliability, it’s the last thing you can expect. Call 01434 683433 for our best price.